Bringing the business and IT together – Why it is essential! We all know that teamwork gets things done. Sometimes it is easier said than done – especially when we have misalignment of objectives. The business need to drive profit and growth, whilst traditionally, the IT teams are there to support that growth and “keep the systems up and running”. In our fast moving world of technology it has become key to have alignment with our business and technology strategies. I am sure many people remember the C-Level roles before the days of the CIO – most of the time the IT related duties would fall to the CFO. As businesses became more reliant on technology, the CIO role became it’s own. This graphic provides insight into how we recognize the need to bring the business and technology strategies together. The COE has traditionally been a Service Provider – they fix issues when the system isn’t working properly. They support the business teams. Today a fully integrated COE needs to operate not only as a service provider, but as an IT partner and collaborator to the business. The COE first needs to have solid processes in place, that integrate with the business to continue with providing support. Process Efficiency is key to this – having a standardized process for incidents / changes for example. The organization needs to be set up in such a way that the process is standardized End-to-End – meaning, from intake of incident, through to deployment of a needed update / change, and that the team involved have the adequate skills to move incidents/changes through the process, without issues once deployed into the productive systems. In order for a COE to become a full collaborative partner with the business, they must also fully integrate with all other areas concerned with IT Operations. 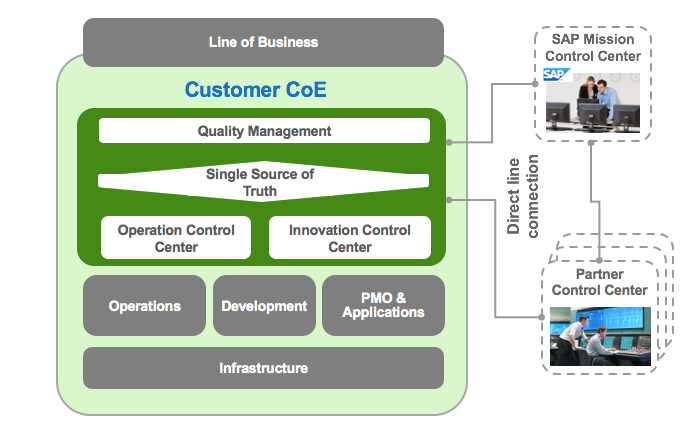 The graphic shows how the Line of Business is closely connected with the COE – this is typically through Business Process Owners and Subject Matter Experts (SME’s). As we move forward with the COE concept to become more aligned with the business, it is about looking at newer technology, and improvements to applications, that can streamline, and provide more efficiencies not just in IT (with better technology), but also within the business – bring value through innovation. It becomes the role of the COE to provide information to the business of advances in applications. For example this can be done through the Innovation Control Center – providing demos on how applications can drive more value and efficiency through the business, utilizing standard technology, and less customization. The ability to drive an agile implementation, derives from having less customizing, and implementing standard applications out of the box as much as possible. Support becomes more streamlined and easier with less customization – and to drive the business towards the standard is key to alignment, and essential for realizing value to the business. Many times the IT/COE teams talk in a more technical manner, and don’t always understand the objectives of the line of business they are in contact with. By putting in place an organization, that is aligned with the business, is a great start on the journey from “just a service provider” to Providing Service AND Innovation. Ensure your COE and IT Operations Model is conducive for your business – What are the needs of the business? End-to-End standardized and best practice processes within the COE is key to ensure the business see “One Face” and have “One Process” to follow. 1 tool, 1 entry point for changes as an example. Integration to behind the scenes tools that are COE/IT specific should be considered, but don’t expect the business to know which tools to use when. In fact – streamline and simplify by evaluating the tools you do have – less handoffs between tools means less chance of failure. In other words – streamline your IT Processes, and minimize the various tools used. Once you have your model in place and a streamlined and efficient set of processes, that connect End-to-End between the business and IT, you can then move onto the next phase of maturity. Quality within your COE is key to help not only provide value within the COE and IT Operations, but to provide valuable information on the value that the COE brings to the business. A Quality oriented COE provides the essential link to the business of how Support and Innovation can bring about increased value for the overall business and business strategy. By having a COE that is organized and skilled, gets closer to the strategy and objectives of the business. Implementing improvement programs from within the COE that will enhance the user experience and add value to the business is key to ongoing COE success. Having a COE that provides more than a service of “fixing issues” demonstrates the ability to keep aligned with the business, building a strong relationship that enhances the overall value. Once you have the previous building blocks in place, the alignment with the business becomes much easier. It isn’t just about having a good relationship with the SME’s or Process Owners though, it is also about having a COE that understands exactly what the business needs in order to reach their objectives. Be it an improvement to a process, such as reducing the time to complete a month end, or improving the time process to pick/pack/ship, utilizing technology and automation. Understanding the pain points of the business is also key. The essential piece is the alignment, and talking the same language though. Once the COE truly understands what the business is all about, and are integrated into their strategy and objectives, they two teams really become like one. Many times you have a COE that is blasted with fixes or with enhancement requests – and sometimes it is hard to say no, or even to achieve what the business want. The business may not understand the abilities of the technology or applications, however the COE does (or it should!). Improvement programs can run much smoother with the full collaboration across business and COE – with the COE providing updates on innovation. “Talking the same language” – this is the key! This brings me to the next part of the journey – it is by no means the “final part of the journey” – in IT the journey is forever ongoing. Once your business and COE teams fully understand each other and talk the same language you have the building blocks in place to continue the innovative journey, and ability to keep moving with technology at a faster pace. Implementations / roll outs of newer technology are aligned with the needs of the business and will have much smoother transitions. Excellent explanation, as usual, Laura! I enjoy reading your articles and relating these to my hands-on experience at Customer CoEs – previously 5 years with an airlines on Application Support role from its establishment until maturity and now for last 2 years with a technology firm on Change Management role. You have made very good points here, in particular about the change in today’s CoE role i.e. 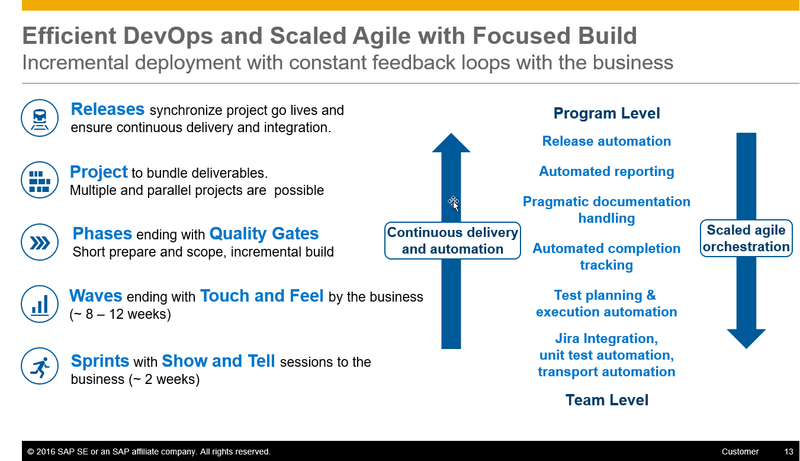 its not just a typical IT Support Organization, rather it has to bring innovation by introducing the new (excellent) products & best practices (SAP has introduced in recent years) to business. For a business to consider new application(s), someone has to explain the new (and exciting) features. The CoE has a role here; while it always have to enhance its internal capability, it also has to introduce the aspects to internal customers. Thanks again for your great contribution on setting up and maintaining the CoE. Great article and timing for all our customers embarking on their digital journey!